These days some of the best works on art history are by historians of science. Last year was particularly bountiful, with a major exhibition (at the Berlin Kupferstichkabinett and Städel Museum in Frankfurt) and monograph on the great German naturalist and painter Maria Sibylla Merian (1647–1717), as well as a groundbreaking show on nature, art and colonialism in Latin America (at the Huntington Library in San Marino, California). Merian remains one of the most extraordinary figures in the history of science. A woman in a man’s world, she was already collecting caterpillars at the age of 13; she learned how to draw from her father (an engraver) and stepfather (a still-life painter). Her caterpillar-hunting took her from her native Frankfurt to the jungles of Suriname and earned her influential friends and material wealth as she settled in Amsterdam to run a studio with her two artist daughters. She also published five influential and beautiful books on flowers and the metamorphosis of butterflies, in an age when most people thought the latter emerged from rotting caterpillars. But Merian refuses to become the modern woman many would like her to be: her advocacy for women in art and science was primarily an advocacy for herself; she employed slaves in Suriname; she kept the names of her daughter artists and collaborators out of all her publications; and she lived for five years in a radical Labadist (a French pietist) religious community, which had a very dim view indeed of independent women. Although she painted on paper, her watercolours on translucent parchment are her trademark and make her flowers and insects glow. She also developed a new way of depicting her subjects, freeze-framing them in different phases of their development. Since her theme was symbiosis, she depicted the plant on which her insects fed and lived (the insects were always life-sized, the plants sometimes reduced to fit the page). This microcosmic world (Carin Grabowski calls it an “Ecosystem”) is strikingly animated—like a history painting in miniature. But Merian was not above making aesthetic changes, even switching ugly plants for more attractive ones to please her readership. Her daughters, Johanna Helena and Dorothea Maria, were quick learners—indeed it is frustratingly difficult to distinguish between the work of mother and daughters, a task Grabowski undertakes consistently for the first time. Grabowski’s is a catalogue raisonné of 124 preparatory watercolours purchased by Peter the Great and now in the St Petersburg Academy of Sciences. The author shows how printmakers’ unauthorised changes spoiled the compositional logic of these originals, particularly Merian’s freeze-frame technique. This book, which begins with a lively biography and is richly illustrated with her other paintings and engravings, immediately becomes the main reference work for Merian’s oeuvre. My only complaint is that the plates are not new but are taken from a 1974 facsimile edition, dampening Merian’s vivid colours and blurring the very details Grabowski is at such pains to discern. One only needs to turn to the Berlin catalogue to see how much we are missing. Maria Sibylla Merian und die Tradition des Blumenbildes considers Merian’s work in its larger context, but with 13 authors it lacks the cohesiveness of Grabowski’s study. In fact, only four of the chapters focus specifically on Merian. Others examine a range of subjects, from the late Medieval devotional books from which the tradition of plant painting derived; Albrecht Dürer and Martin Schongauer’s pioneering paintings after nature; the 18th-century nature painter Barbara Regina Dietzsch; and the impact of herbals on the German Romantic landscape. We see the influence of the naturalist painters Georg Flegel—Merian’s stepfather’s teacher—and Georg Hoefnagel, whose works were among the first Merian copied as a girl. Two fascinating chapters are on plant books commissioned by noble collectors seeking to immortalise their gardens. The earliest is Basilius Besler’s monumental Hortus Eystettensis (1613), featuring hand-painted engravings of the global collection of plants in the garden of the Prince-Bishop of Eichstätt. 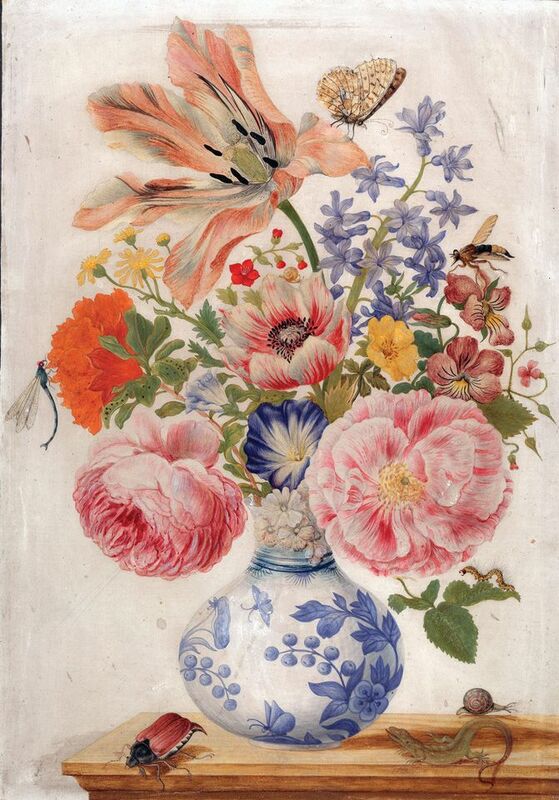 The other is The Nassau-Idstein Florilegium (1650s–60s), painted on parchment by Johann Walter for Johann von Nassau’s garden at Idstein Castle outside Frankfurt. They share Merian’s liveliness and acuity of observation but not her scientific method. Indeed we come away from this catalogue seeing Merian’s work with new eyes, recognising the conventions she followed but also how she left them behind. The painters and collectors of the Berlin catalogue mostly stayed in Europe. But Visual Voyages takes us across the Atlantic. Through 150 paintings, prints, books and objects it shows how Europeans, Amerindians and people of mixed race depicted, collected and made sense of nature in the Americas, from Columbus to Darwin. It is a visual feast, beginning with a stunning 6ft-tall Tupinambá feather cape from Brazil and including two magnificent watercolours by Merian from the Royal Collection. But it is also a story of violence, disease and displacement, as natural science literally emerged from conquest. Naturalism began very early: Gonzalo Fernández de Oviedo, who crossed the Atlantic 11 times, published natural history books on the “Indies” as early as 1526 and 1535, which recorded birdsong and contained the first prints of a pineapple and hammock. Some of the earliest works are by Amerindians, such as Martín de la Cruz’s book of medicinal herbs (1552), which preserved indigenous knowledge and Aztec painting conventions. Late Renaissance woodcuts show the usual round of cannibals and naked amazons but the reader is struck by how quickly natural history painters insisted on accuracy: as with Conrad Gessner’s armadillo (1551–58) or the splendid painting of a three-toed sloth (1626) made for the Roman collector Cassiano dal Pozzo. Nature was also a source of profit, as evidenced by depictions of brazil-wood, tobacco and cochineal—the latter a closely guarded Spanish secret. Empiricism and classification drove Enlightenment naturalists such as Alexander von Humboldt but we also see taxonomy’s dark side, with the “casta” paintings of New Spain, pseudoscientific classifications of mixed-race people. At the end we return to fantasy as the romanticism and nationalism of Frederic Edwin Church and José María Velasco skew reality once more in the 1860s and 1870s. Bleichmar is a consummate storyteller, and the reader happily submits to her virtual tour of a wide-ranging subject that goes far beyond the confines of the exhibition.